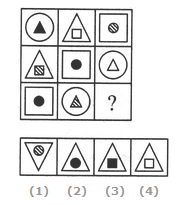 Figure Matrix Questions from Previous Year Exams. 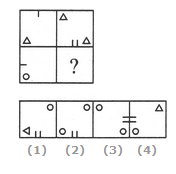 In each of the following questions, find out which of the answer figures (1), (2), (3) and (4) completes the figure matrix ? 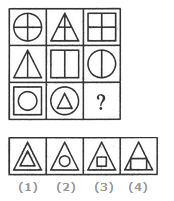 Select a suitable figure from the four alternatives that would complete the figure matrix. 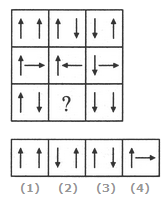 In each row, the second figure is obtained from the first figure by reversing the direction of the RHS arrow and the third figure is obtained from the second figure by reversing the direction of both the arrows. 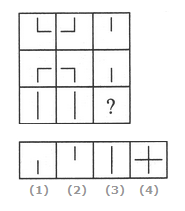 In each row, the figures are getting laterally inverted in each step. 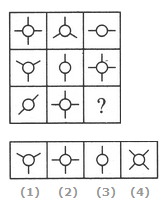 The number of components or the quantities are either increasing or decreasing from left to right sequentially. 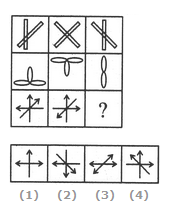 The second figure is obtained from the first figure by moving the line segment to the opposite side of the square boundary and replacing it with two similar line segments. Also, the element in the lower-left corner gets replaced by two similar elements - one placed in the upper-left and the other placed in the lower-right corner. 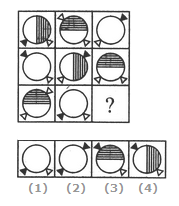 In each row, there are 3 types of shadings of circles - a circle is unshaded, another circle has its right half shaded with vertical lines and yet another circle has its upper half shaded with horizontal lines. 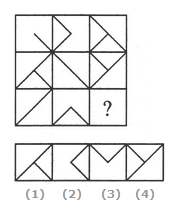 There are three specified positions of the two triangles each of which is used only once in a row. 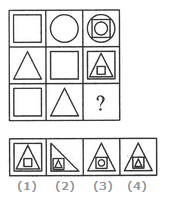 Also, two of the figures in each row have one triangle shaded. 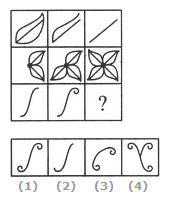 In each row, the third figure is a collection of the common elements (line segments) of the first and the second figures. The number of components in each row either increases or decreases from left to right. In the third row, it increases. 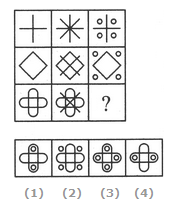 Each row (as well as each column) contains a figure consisting of a circle and two line segments, a figure consisting of a circle and three line segments and a figure consisting of a circle and four line segments. 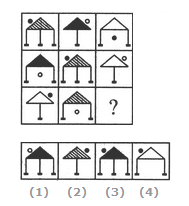 In each row, the second figure is obtained from the first figure by increasing the number of smaller elements by one and the third figure is obtained from the second figure by increasing the number of smaller elements by one. 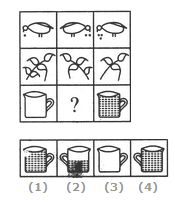 The third figure in each row comprises of parts which are not common to the first two figures. In each row, the triangle follows the circle, the square follows the triangle and the circle follows the square. In case of the third row, the above rule exists for the inner as well as the outer elements. 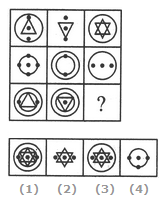 In each row, the second figure forms the innermost and the outermost elements of the third figure and the first figure forms the middle element of the third figure. 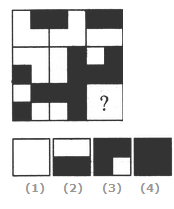 In each row, the second figure is obtained by shading one of the four parts of the first figure and the third figure is obtained by shading two out of the four parts of the first figure. In each row, there are three types of outer elements (circle, triangle and square), three types of inner elements (circle, triangle and square) and three types of shadings in the inner elements (black, white and lines). There are 3 types of shadings in the triangles, 3 types of legs, 3 positions of circles, each of which is used only once in a single row. The circle is shaded in alternate figures. 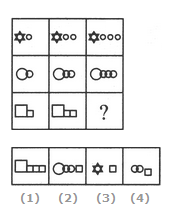 In each row, the third figure is a combination of the first and the second figure. 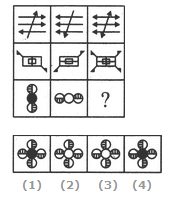 In each row, the second figure is obtained from the first figure by adding two mutually perpendicular line segments at the centre and the third figure is obtained from the first figure by adding four circles outside the main figure. 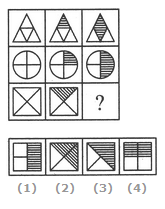 In each row, the third figure comprises of a black circle and only those line segments which are not common to the first and the second figures.